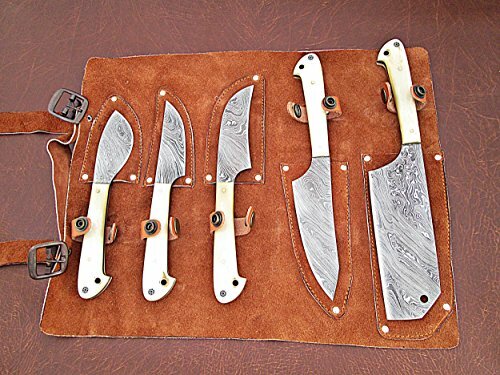 HANDLE MATERIAL: Camel Bone - You will receive 5 Damascus Steel Kitchen Set Knives of different sizes. - SHARPNESS: VERY SHARP - DAMASCUS STEEL: 1095 AND 15N20 - BLADE LAYERS: 200+ TRUE LAYERS - BLADE HARDNESS: 58 - 60 HRC ===========>>> HISTORY OF DAMASCUS STEEL: From 300 BC to 1700 AD Damascus steel was the high quality steel used in blades and it was famous for making strong swords so well-forged that it could bent under pressure without breaking, yet held an edge so sharp it could cleave a big piece of wood in half with only the force behind one arm. During Middle Ages Damascus steel was used to make swords and the art of making Damascus steel was considered as a secret. Then a time came when process for making the original Damascus steel was lost. But it emerged again though modern day Damascus knives are not made in the same way as the medieval Damascus blades. The reasons for this are obvious, as no one knows exactly how those blades were made. ===========>>> ABOUT OURSELVES: If you are looking for a better quality knife or blank blade at a good price then LEATHER -N- DAGGER is the right place for you. We make our products with care and spent hours of work. We use high quality material and we do excellent finishing. We make few knives but with love & quality. You will receive good value for money. You will be proud to give our knives as GIFTS, if you want, to someone you know. Our quality products deserve good price. We strive hard to give you good rates for such quality knives but if you are looking for low priced knives (surely low quality) then this is not the right place for you. Your satisfaction is guaranteed with us! If you are not satisfied with our knives, you can return them for a full refund within 14 days and we will not ask any question. ==> DURABILITY OF OUR KNIVES: Our knives/blades will serve you as a good companion for several years. WARNING: Please buy only from Leather-n-Dagger (Sold by Leather-n-Dagger and Fulfilled by Amazon). Other sellers (cheaters) are selling FAKE COPIES of our products with CHEAP QUALITY. Our branded products are: "Leather-n-Dagger", "ColdLand Knives" and "Rocky Knives". Thanks a million!!! Surprise your friends and family with these rare beauties. You will receive 5 Damascus Steel Kitchen Set Knives of different sizes. IMPORTANT NOTE: This is our stock photo. You will receive different Damascus pattern as every Damascus Blade is unique in the world. Leather sheath and scale colors may be different too. 100% satisfaction guaranteed or fully refunded. Hand forged by using 1095 & 15N20 steels. Over 200 true layers of Damascus steel. Good Quality. Will long last for several years (lifetime if handled with care). Hardness: 58-60 HRC on Rockwell Scale. If you have any questions about this product by ColdLand Knives, contact us by completing and submitting the form below. If you are looking for a specif part number, please include it with your message.